송나라의 명신(名臣)들이 황제에게 올린, 시정(施政)에 관한 각종 표문(表文)과 전문(牋文) 중에서 뛰어난 것을 뽑아 편찬한 책으로, 편찬자는 미상이다. 규장각 소장본은 1403년(태종 3) 주조된 조선 최초의 금속활자인 계미자(癸未字)로 간행한 것으로, 권7 부분만 남아 있는 영본(零本)이다. 본서의 크기는 가로 19㎝, 세로 29㎝이며, 모두 12장으로 구성되었다. 본문의 제10~12장은 일부가 손상되었고, 책의 뒤표지도 결락되었다. 책의 앞뒤에 종이를 1장씩 첨가한 후 진한 황색포 표지를 새로 입히고 붉은 면으로 보강하였다. 계미자는 사용한 기간이 짧기 때문에 현재까지 전해지는 계미자 판본은 희귀하다. 따라서 본서는 고려와 조선초기의 활자주조술, 인쇄조판술사 및 활자체 연구에서 있어 매우 귀중한 자료이다. This anonymous book was printed sometime in the reign of King Taejong, Joseon Dynasty (1402-1418) with gyemidonghwalja, the first metal type font invented in 1403. 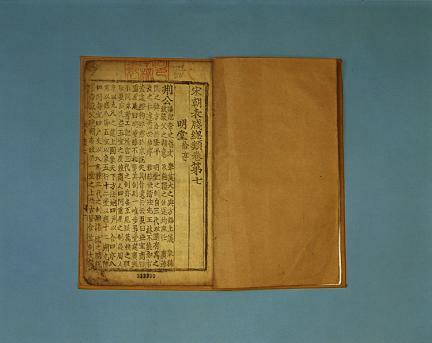 It is a single book with 12 chapters, measuring 19cm wide and 29cm long. Some parts of chapter 10, 11 and 12 are in poor condition and the rear cover of the book is missing. Instead of the back cover, a piece of blank paper is inserted into the front and rear end of the book and a dark yellow cover is added, and the book is re-bound in red cotton cloth. It is one of the rare books printed with gyemidonghwalja, serving as an excellent material for studying early metal types.